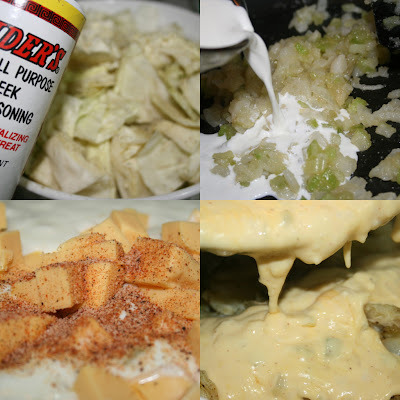 Cajun Cabbage Au Gratin Casserole, a seasoned cabbage baked with a Velveeta cheese sauce. Had some cabbage on hand so decided to do an au gratin for y'all. I am happy that it is "casserole season," but I hate the way that casseroles photograph - the pictures just do not ever do justice to the dish - but don't let that lead you. There's really nothing to this recipe, but it's delicious if you love cabbage like I do. Just microwave the cabbage with some Cavender's seasoning and butter to precook it a little. Saute the celery and onion and thicken with a little flour and half and half, toss in Velvetta and a little Cajun seasoning, stir it all together, top with some bread crumbs and bake. Easy. Maybe not so pretty, but good and buttery, as it should be, if you love cabbage, this is for sure comfort food. Preheat oven to 350 degrees F. Cut cabbage into bite sized chunks and place into an oven and microwave safe covered casserole dish. Sprinkle all over with Greek seasoning, toss, sprinkle again. Cut butter into slices and scatter on top. Cover and microwave for 15 minutes; set aside and keep covered. Pour cheese mixture evenly over the cabbage. 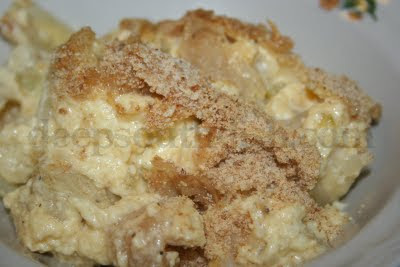 Add the Parmesan cheese to the bread crumbs and place evenly over the top of the casserole. Bake uncovered at 350 degrees F for 30 to 40 minutes, or until mixture is bubbly and topping is lightly browning. That sounds really good ! I agree- sometimes the most delicious dish just doesn't look all that good in a photo. I have a barley soup that is wonderful- but a more boring photo I have never seen. Anyway- I like yours- Velveeta is not used much anymore but I bet I have 5 or 6 casserole recipes that use Velveeta. I've had lots of gratins, but never a cabbage gratin! Never heard of this one- but will try it- I love all the flavors. I've heard of cabbage casserole, but never eaten it, but it looks delicious! Smoothered in cheese it has to be good! Thanks for the recipe, Mary, I'll have to try this one as I love cabbage. I just discovered the glories of cooked cabbage (after a lifetime of running screaming into the night avoiding my sainted mother's boiled cabbage). I really like the idea of this, it's very outside of the box. I could definitely get my husband to eat cabbage if i served him this. I can never get my casseroles to photograph well either. They end up looking not so appitizing. Anyway, hope you're having a good week so far. I'm having a card GIVEAWAY on my blog: http://730apron.blogspot.com/ All are welcome! Thank you for this terrific recipe! Believe it or not, I made this on Sunday and it was more popular than the gumbo. Used grated cheddar instead of velveeta (couldn't find it here in NYC) and it melted beautifully in the half and half. Delicious! So glad to have found your blog! I'm so glad you found you way here too & thanks so much for the feedback! I'm glad everybody enjoyed it. Hi Mary, Just wanted to let you know how good your cabbage casserole was. I think the Cavenders seas. really gave it a good flavor! Was looking for something to go with porkchops, came to your site, looked under casseroles, and the cabbage casserole sounded good, hubby even commented on how good it was. Thank you for another wonderful recipe!!!! You're so welcome Louise!! I just love Cavender's for cabbage but you can use it on lots of other things too so experiment with it where you would use another all purpose seasoning!